please is there somebody who can tell me how to import data from roboform in htlm. We will definitely help you in migrating your data from RoboForm. Open RoboForm-->Click On RoboForm Icon-->Select Logins -->Save this file as "filename.html". Cheers and welcome to Enpass! I'm new too. I was able to migrate my data from Roboform per your instructions, with one minor hiccup. I used an invalid name for the .htm file that I saved from Roboform. Basically, my Windows filename had imbedded blanks, so that your tool, which was looking for an .htm file could not find it (it saw the file as a folder). One useful tip for new users would be to make sure that you save your Roboform file using an appropriate file name. When you suggest "filename.html" some of us might not be aware that you intend to require precisely this name. BUT, I still cannot get Enpass to work. I saved the Roboform dataset in the "login" category in Enpass. It seems to be there. I added the Enpass extension to Firefox and opened some test Websites. The extension shows the correct icon and name for the login, and all of the data seems correct. However, when I click on the icon, nothing happens. If I fill the page out manually, Enpass saves the login info and then I can click on the new icon without problems. What am I missing? All of the imported data seems to be present, but it does not work (yet). I am using Windows 10 desktop and Firefox 46.0.1 and hope to use Enpass on my Windows phone. Thanks! Hi, I'm looking at Enpass after all the revised hype surrounding this software and the Edge extensions. I am coming from RoboForm which I have used for a long time. I am using Version 7.9.19.7 of RoboForm and your instructions to Export logins makes no sense. I'm not sure if it's just out of date or if I am missing something obvious. Currently I am unable to Export my data from RoboForm in a format that Enpass can Import so I am hoping you can clarify your instructions please. 1 - Open RoboForm - RoboForm is always open, it runs in the TaskBar so I'm not sure what you mean here unless you are talking about opening the RoboForm Editor which is done by clicking the icon in the TaskBar and selecting Editor. 2 - Click on RoboForm Icon - Do you mean the main RoboForm menu button from within the Editor or are you talking about the icon in the TaskBar? 3 - Select Logins - If step 2 is referring to the main menu within the Editor, there is no Logins option in that menu to select. If Step 2 is referring to the Logins Sub Menu from the TaskBar icon then this just opens another sub menu and is not selectable. There is a Logins Tab within the Editor that is selectable. 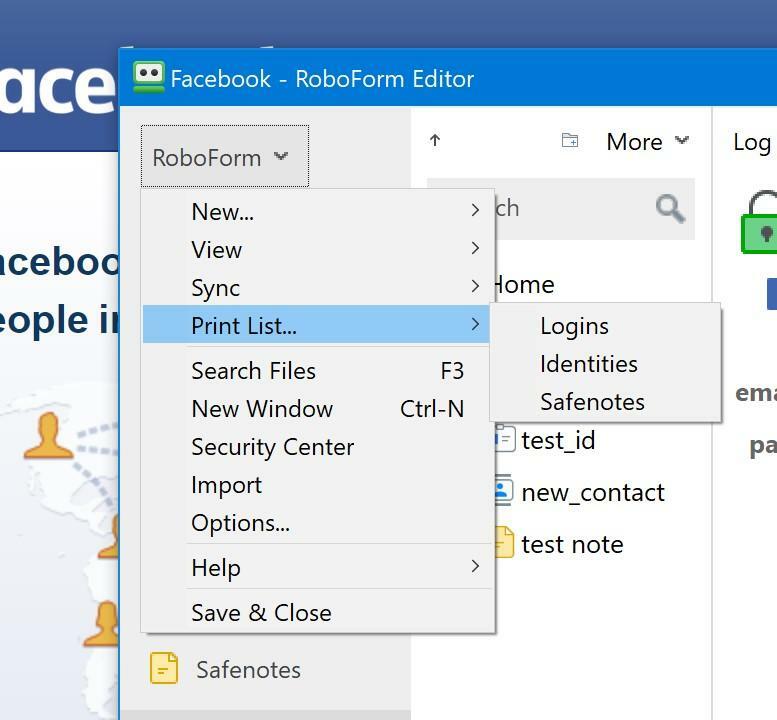 4 - Save this file as... - There are no options within the version of RoboForm that I have that includes a Button or Menu Item that is Marked, "Save" or "Save As" unless it is referring to a change of information for an individual login. There is a facility to export and HTM file from RoboForm but this is within the Options (Click TaskBar Icon -> Select Options...-> Select User Data. However this appears to just create an HTML file of Bookmarks with no credentials included and Enpass won't import this anyway. Please help, I would very much like to move over to Enpass for both the Edge Extensions and use on my Windows 10 Phone but not being able to transfer my data is a show stopper for me. Login into RoboForm --> Click on RoboForm icon in the Menu --> Click on Print List --> Select Logins --> Then it will asks for Enter Master Password --> Click on Skip All button--> And then click on Save button and save this file as "filename.html". For more details please see the attachment. Similarly follow these steps for Identities and Safenotes. Importing the Roboform data to Enpass. BTW, I would also like to let you know that recently RoboForm has changed their export format with some changes in the password field. For more details please refer. The new instructions make sense now, I guessed that maybe the version change was responsible. So I am now in the same position as the other poster in the "Importing Folders" thread in that the RoboForm Import appears to do the same as the KeyPass import and it flattens out the folder structure, which is going to be an annoyance for me too. Also, can you tell me if Enpass supports "Profiles"? Within RoboForm I have several different profiles for grouping logins, identities and Safe Note in related groups. So for example I have Business and Personal data stored in two separate profiles, each profile has logins, identities and Safenotes relating to either my business or my personal data. Each Profile has it's own Master Password so I can separate data accordingly. I could mimic this within Enpass by using subfolders but it would be like putting all my eggs in one basket. Thanks for your reply. We’ve been working hard to improve Enpass import capabilities, I have noted this issue in our roadmap for future version. I just buy Roboform and what does that mean? if you have ever become aware of the icon little green icon on the task bar from time to time has black sunglasses. Any suggestions, how to import from current roboform version? Hey guys. Just installed the Store version. Had problems too with importing from RoboForms v7.9.28.8. Here is how I got it to import all 500 passcards. 1) Open RobForms Editor and and click on the icon on the top left. 2) Go to Print List>logins. 3) Enter the Master Password and click on OK. This was the problem with the earlier post. You have to unlock the passcards FIRST. 5) Save to Desktop as a HTML format and name the file. I used Passwords. 6) Go to Enpass and go to File>Import. 8) Make sure that first box has Login (Windows) HTML. 9) Browse to your Desktop and select the the icon NOT the file. Mine has Chrome icon. 10) Hopefully, Continue will be available. If it is, click on it and just wait until ALL your passcards are imported and Enpass says Done or whatever. Mine works just like RoboForms did in both Chrome and Edge. @robertwhy think you can do it, it's because of your old Roboform version 7. With the new 8er-Roboform you can't do it anymore. Can't help there as I do not want v8. Doesn't it store ALL your passcards in the Cloud? Isn't v8 yearly subscription? I want it on my computer where only I have access to everything and have a lifetime license...1 time payment. Just trying to help where I can. I know v7 is outdated, but it worked for me for so long but it's time to move on to a newer software. That's why I have been looking for a new Password Manager. Came across Enpass from a review at gHacks. first thanks for your efforts describing the procedure, but I cant see a difference in your post comparing to the post from Anshu kumar on July 29, 2016, which I followed and it doesnt work any longer. So what in particular does point 9 in your description mean? in my file-open-dialogbox is no separated icon, it is a part of the representation of the file together with the filename. Soif it works for you, we should find the difference, which let it fail on my site and for some other users too. EDIT: Ah, reading is important -)): The difference is Roboform Version 7. So perhaps the devs of enpass can support us with a template to import from old version, so I could try to develop a filter to convert the html to the old version? If you are using v8, my suggestion is to download v7 and activate it, and hopefuly, you can do what the steps I have posted to export ALL your passwords into Enpass. Like I posted earlier, Store Enpass v6 works well...in both Chrome and Edge. Do not know about Firefox. P.S. Ever time I Clean Install Win xxxx, Roboforms v7 just activates. Never had a problem; as long as you have a Lifetime License. I tried your suggestion to install roboform 7, but did not get it managed to import/restore the previously exported data from version 8. old backups from roboform 7 data files are importable, but this is useless because the data are outdated. How to import logins and passwords from Roboform 8? hello, could somebody from support get in touch here soon and tell me what's going on? Why does the import into Enpass 6 from Roboform 8.x data not work? Is this a bug that will be fixed in the near future or is it just not possible in this combination anymore? We have tested with 8.5.5 version of RoboForm. Make sure you export data from the menu as shown in screenshot. If still didn't work it may be a language or configuration issue. Okay, found part of the problem. The logins and identities can be imported if you change Roboform 8.x interface from e.g. German to English. Only the SafeNotes still get the error message "Nothing to import". Too bad, but in the SafeNotes I have stored a lot of important information. ochange Roboform 8.x interface from e.g. German to English. yes, hope that the Enpass-People soon find a way that "we" can import everything again. So I can't use the software. Back then 2 years ago, it was still possible with Enpass 5 (store version) and Roboform 7. I bought the current Enpass 6 - version again for 6 Euro and can't use it. I wanted to change from Roboform 8 to Enpass 6, but it doesn't make sense. Seats on over 500 not yet imported Safe-Notes, which do not work. Please, please dear Enpass team. Do something! some progress here: if I replace german Umlauts and other special characters inside the data fields in the exported html from roboform, I'm able to import the logins step by step. By now I reached a number of 800 imported logins. so I get closer when I choose a subset of my data and and, if it failes to import, removed the last half of the subset, repeating with removing the last half of the subset from the not properly imported subset and so on.